The US version of the Palm Pre has been one of this year's hottest sellers stateside. European customers have been anticipating the launch of a GSM version in Europe for some time, and Palm have now announced that they are partnering with Telefónica to bring the Pre to the UK, Germany and Ireland (under the O2 brand) and Spain (under the Movistar brand). 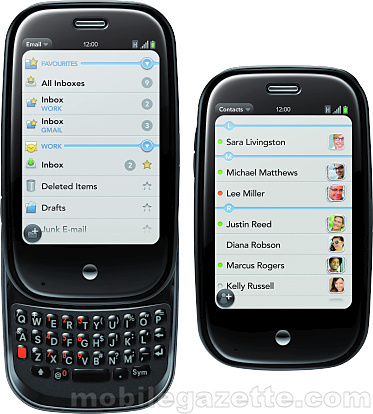 The Pre's key selling proposition is the new webOS operating system which allows true multitasking in a novel interface that is designed to make managing multiple applications as easy as possible. 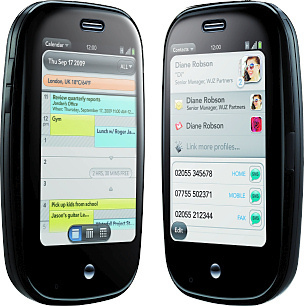 In terms of technological "wow factor", the Pre is one of the few handsets that can compete head-to-head with the new iPhone 3G S.
Most of the specifications are unchanged from the US version of the Pre, but this one is a GSM device with support for UMTS (3G) and HSDPA (3.5G) data, in addition to WiFi. The Pre also has GPS, a 3.1" 320 x 480 pixel touchscreen display, a 3 megapixel camera with flash, a standard 3.5mm audio jack, Bluetooth and USB connectivity. Internal memory is 8GB (7GB is available to the user), but this is not expandable. We won't repeat all the specifications from the original, but overall this is a very attractive package. The slide-out keyboard is a QWERTY one in the UK, Ireland and Spain. In Germany the Pre will come with a QWERTZ keyboard instead. Reviews of the original Pre indicate that the keyboard is best ignored in any case. As far as we can tell, the European Pre is cosmetically identical to the US one. The main difference that we can see in the press photos is an "H" in the top right corner of the screen indicating an HSDPA connection - in the US you would typically see "EVDO" instead. We mentioned the iPhone, and although we would say that the Pre is a direct competitor, the iPhone has different strengths and weaknesses. In the main, we would say that the iPhone's huge range of applications is something that the Pre can simply not match. But the sophistication of the Pre's operating system is far in advance of the iPhone. In truth, both handsets are very good indeed, although both have their flaws. Given that the Pre is a direct competitor to the iPhone, it's a bit annoying to find that in the UK both the iPhone and Pre are only available on the O2 network. Obviously, that's good news for O2 though! There's no guidance on price, but we expect the Pre to be quite expensive. Palm and Telefónica say that the Pre should be in European shops by Christmas this year.